COUNCIL BLUFFS, Iowa — President Donald Trump came to America's heartland Tuesday to lay out his plans for the future of ethanol. In an appearance at the Mid-America Center, the president announced plans to allow the year-round use of gasoline with 15 percent ethanol. 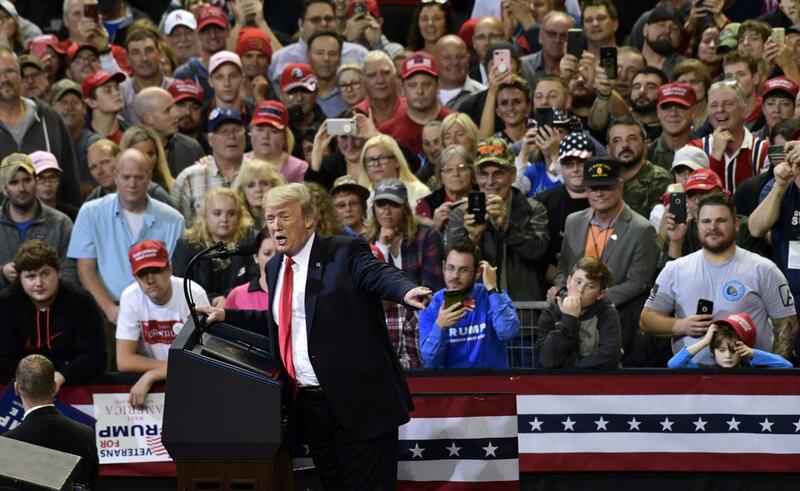 Trump said he had made a promise to his voters both during his presidential campaign and during the Republican primaries that he would allow more ethanol in fuel. "Promises made, promises kept," he told the crowd of about 7,000, many wearing Trump hats or carrying Trump signs. The choice of Council Bluffs, right on the border with Nebraska, seemed appropriate, as Iowa ranks No. 1 in ethanol production and Nebraska second. Iowa also is home to Sen. Chuck Grassley, the Senate's top ethanol proponent and the chairman of the Senate Judiciary Committee who helped steer the nomination of Brett Kavanaugh to the Supreme Court successfully through a contentious hearing process that included allegations of sexual misconduct. Trump's ethanol announcement and visit to Iowa are viewed by some as a reward to Grassley for his work on the Kavanaugh nomination. At Tuesday's rally, Trump referred to Grassley as a "tough cookie" and an "Iowa legend." The appearance also may be timed to placate farmers who, struggling with years of declining commodities prices, have taken a further hit this year because of the administration's trade battles with China and other countries. In Nebraska, which in addition to being second in ethanol production ranks third in corn production behind Iowa and Illinois, the announcement was cheered by both elected officials and industry groups. “Year-round sale of E15 is great news for Nebraska and our farm families as we continue to work to meet the challenge presented by low corn and soybean prices," Gov. Pete Ricketts said in a news release. Ricketts, who was in attendance Tuesday, said more consumption of higher ethanol fuel will spur more demand for Nebraska-grown corn. Sen. Deb Fischer, who joined Grassley and other senators in a White House ceremony earlier in the day to mark the E15 announcement, said the proposal is "a big deal for Nebraska farmers, renewable fuel producers and rural communities." Democrats in Iowa and Nebraska, while not directly commenting on the ethanol policy announcement, criticized Trump and other Republican leaders for what they called "rhetoric and policy inconsistent with American values." "Nowhere is this more evident than in the promises made and broken here in the Heartland," state party leaders said in a joint statement. "Our farmers and rural communities have been left in the dust by the Trump Administration, Governors (Kim) Reynolds and Ricketts, and their Republican allies." The ethanol proposal still must go through an Environmental Protection Agency rule-making process, which would likely delay its full implementation until next summer. The summer months are when gasoline containing more than 10 percent ethanol content currently is banned. The rules were put in place as an anti-pollution measure because of concerns that ethanol exacerbates smog issues, especially on very hot days. The ethanol industry says those claims are unfounded, however. “E15 is the most tested fuel ever,” David Bruntz, a farmer from Friend who is chairman of the Nebraska Corn Board, said in a news release. “Today’s announcement by President Trump is a win for corn farmers, the rural economy, motorists and anybody that likes to breathe clean air." The oil industry opposes year-round sales of E15, warning that high-ethanol gasoline can damage car engines and fuel systems. Some car makers have warned against high-ethanol blends, although the EPA has approved use of E15 in all light-duty vehicles built since 2001.